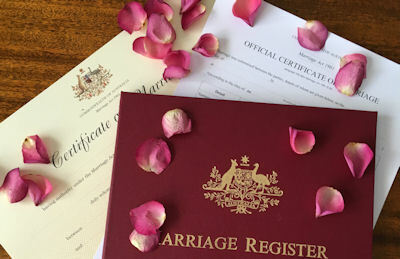 In Australia, no matter whether you marry in church, the registry office, or by a civil celebrant, and no matter whether you have the big white wedding with a large wedding party, or choose just to elope, the one thing that every wedding must have is two witnesses, no more and no fewer. These two people, if it comes to it, who can stand up in a court of law and attest to the fact that they were present when you made the legal vows that created your marriage. While in a traditional wedding it is usual for the two witnesses to be the Best Man and the Maid of Honour, it does not have to be that way. 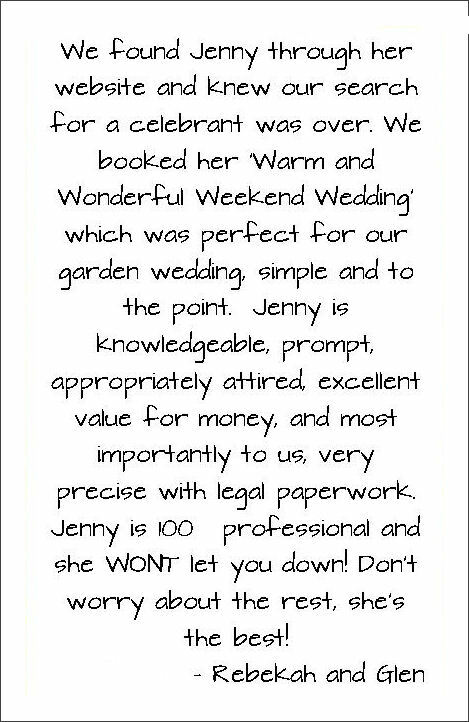 Your witnesses can be other persons present at the wedding. Members of your wedding party. As long as they are present at the wedding (and can see and hear you make your vows) they can be sitting with your guests. Choosing your mothers, grandparents, the couple who introduced you, or people you want to honour, for whatever reason, adds a lot to the ceremony. Persons who do not speak and understand the language in which the ceremony is conducted as long as an official interpreter is present to translate. Although it is quite commonly believed that the witnesses witness the marrying couple’s signatures on the register and marriage certificates, this is not true. The register and certificates are evidence that the marriage has taken place. So when the five people (couple, 2 witnesses and celebrant) sign the documents, no-one is witnessing anyone’s signature. What each is doing is confirming that the marriage took place. What marries the couple is the mandated words (the vows). Once they have both said those words, they are legally married. So the certificates are just evidence that the marriage has taken place. When you and your witnesses sign the certificates it is not like witnessing signatures on a will, for example, where it is the signature of the testator (the person whose will it is) that activates the will, and the signatures of the witnesses are witnessing the signature of the testator. What else do you need to think about in relation to witnesses? Make sure that the signing table is set up to one side, but up the front, near where you and your wedding party are standing. You could also have the signing table behind you, if you are standing in front of a gazebo, rotunda, or arbour, or you can have the table carried from where it has been placed, at one side, to in front of where you are standing, to give everyone a clear view of the signing, and your photographer and videographer the open space and line of sight created by the aisle.If you put it behind the guests, you will have to walk past them, and that will delay everything because they will, naturally, assume you are walking back up the aisle, that it is all done and dusted, and it is time for congratulations. If your witnesses are not part of your wedding party, guests crowding round you could make it very difficult for the witnesses to get to the signing table. The order in which the register and certificates are signed is marrying couple first, witnesses next, celebrant last. Once you have signed, and your photographer has finished taking posed photos, you will need to vacate the seats to allow your witnesses to sit down. Make sure you move to behind the table, not to where the guests can crowd around you, and delay the completion of the ceremony. Because their full legal names are written out on the certificates and register, it is not uncommon for witnesses to think they have to sign that way. What is required is their normal signature.